I hope y’all know that Philly Fringe is going on right now. In case you don’t, give it a go! 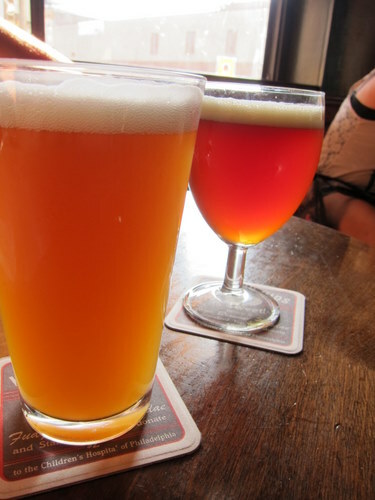 After checking out a fringe event, we mosied, and we actually mosied, over to Standard Tap. I’d been here for drinks, but never food. I guess it’s been a long time coming. Their menu changes frequently and is written on chalkboards. Man, I have terrible eyesight. I always have to walk over and stand right in front of it. They had a wide range of options available, but in the end, we both went for the burger. People rave about it, so I had to check it out. The burger! It’s served with cheese and a thick slice of seared onion, mushrooms, lettuce and tomato on ciabatta bread. You also get a heap of fries and some pickles. The burger is really good! It was juicy and cooked to what I asked for, and the toppings were good. The giant slice of tomato was incredibly flavorful! The fries are great too. My only problem was with the bread. The outside of the bread is so hard and inflexible that when I was trying to bite into the burger, the inflexibility of the bread made all of the innards be pushed out. So it often ended up being a mess. M just ignored the bread completely and just stuck to the innards. I also would have preferred that the onions were cooked more, but that wasn’t a big deal. All in all, a very solid burger. Mmmm looks so good! 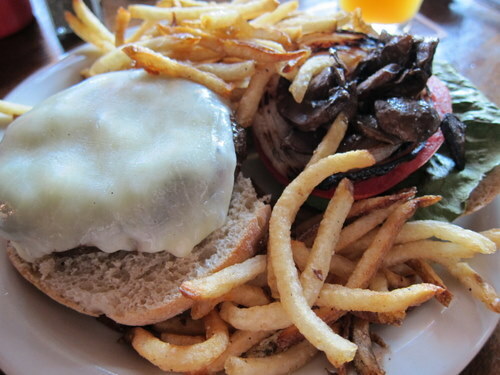 That cheese on the burger looks amazing… and those fries… Mmm.